A photographic journey through Ukraine’s ‘21st-century city’. Slavutych is a purpose-built city in the north of Ukraine, that was created to house civilians evacuated from the Chernobyl disaster of 1986. It is situated 200km directly north of Kiev, 45km east of Pripyat (the main city serving the Chernobyl Nuclear Power Plant) and 40km west of Chernihiv, the city we used as a base for our visit. 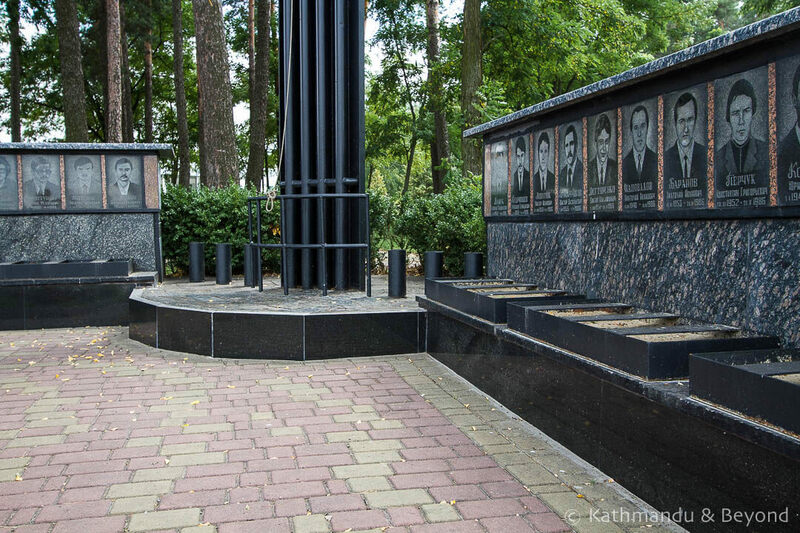 Slavutych was constructed in the same year as the Chernobyl disaster and we found out about its existence via our friend and fellow travel blogger, Megan Starr, who wrote an enlightening article about the city after her own visit there. There are many interesting (and conflicting) facts about the city. 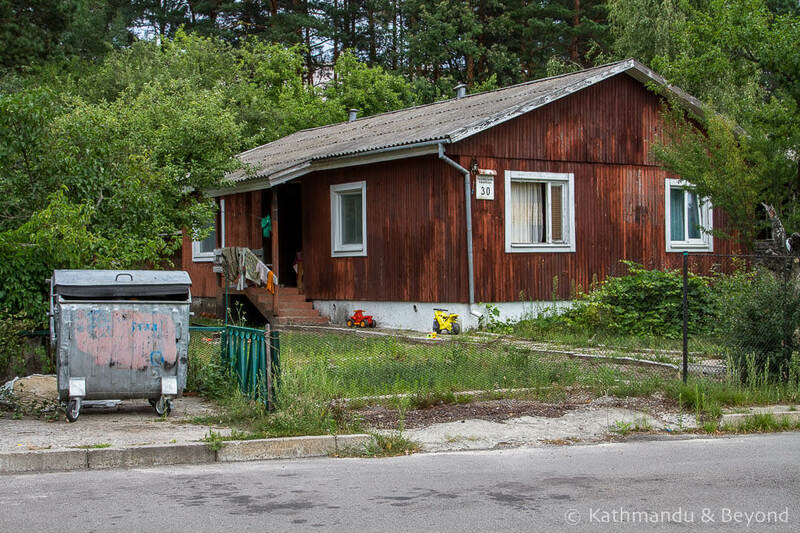 For example, many of the city’s residents still work at Chernobyl. One article I read suggested the number was close to 11,000, while another puts the figure more towards 3,000. If it is the former, that’s pretty high for a city with a population of approximately 25,000 (census 2014). Either way, there is still a commuter train that crosses Belarusian territory in order to transport workers to and from the plant on a daily basis (*). (*) The train crosses through the Belarusian Polesie State Radioecological Reserve which was ‘created to enclose the territory of Belarus most affected by radioactive fallout from the Chernobyl disaster.’ (Source). What’s more, Slavutych was designed with children in mind. A high percentage of those who moved there were young and lots of green space and play areas were incorporated into the city’s blueprint. 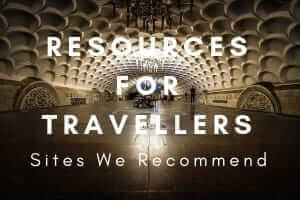 I could go on but rather than duplicate other people’s work I would urge you to read Megan’s post and some of the other articles I have listed below if you want to learn more. Rather, I prefer to take you on a walking tour of the city using the photographs we took during our visit in the summer of 2017. 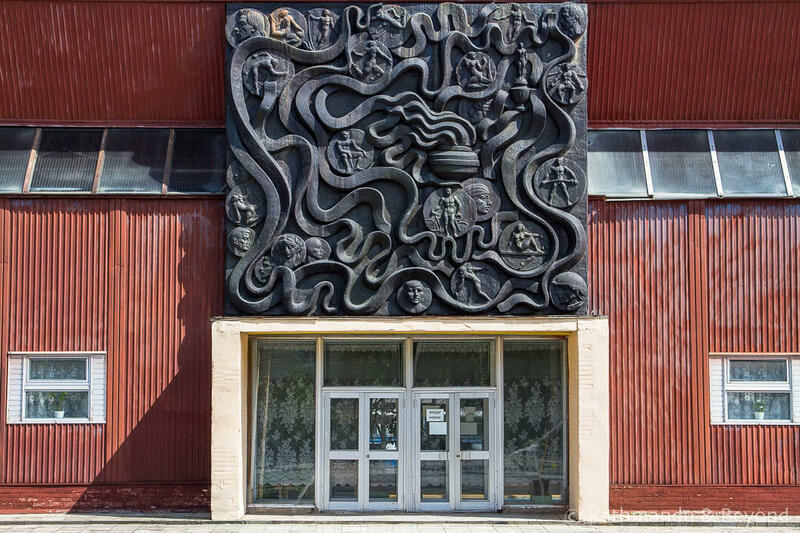 One of the most interesting aspects of Slavutych is the fact that it was designed and built by architects and workers from eight different countries, all of which were part of the Soviet Union at the time. These were Armenia, Azerbaijan, Estonia, Georgia, Latvia, Lithuania, Russia and Ukraine and representatives from each one were tasked with planning and building a section of the city that was indicative of the architectural style in their own country. As well as architects, the necessary building materials and even some of the labour were brought in from the respective countries and although not wildly different in design – after all, they were all part of the Soviet Union at the time – on closer inspection it is possible to notice regional characteristics as well as subtle differences between each of the quarters/districts. Woodland like this surrounds much of the centre of Slavutych. An example of a low-rise, wooden house on the outskirts of the city centre. The centre of Slavutych is not large and it takes about four hours to see it properly on foot. As you can see from the below map, it’s an easy place to navigate. We were dropped off close to the railway station and started our exploration in the Yerevan Quarter, making our way anticlockwise through each of the other quarters until we got back to where we started. Beyond the quarters shown on the map, there isn’t much at all. In fact, it’s mainly woodland but it is worth detouring off to see the Medical Centre and the newly built Church of God’s Prophet Elijah, both of which are to the west of the Tallinn Quarter. Also if you stray from the centre you will notice quite a few wooden houses, typical of the style you find in other Ukraine towns and villages. They are in stark contrast to the rest of the brick-built/concrete homes in the city, which are practically all apartments and located in tower blocks. We wondered if the regular houses have always been there, i.e. prior to 1986, or whether they were built at the same time but for the privileged few only. One of several monuments in the city dedicated to the Chernobyl disaster. This quarter is slightly out on a limb compared to the others. It can be reached by walking through the back side of either the Baku or the Tbilisi quarter. Given Chernihiv is a city in Ukraine, it made me wonder why it wasn’t located near the Kyiv Quarter rather than where it is. Not surprisingly, this is collectively the largest district in the city. Not to be confused with Beograd (Belgrade), which was the mistake we initially made before thinking it through. Belgorod is a city in Russia, north of the Ukrainian border. 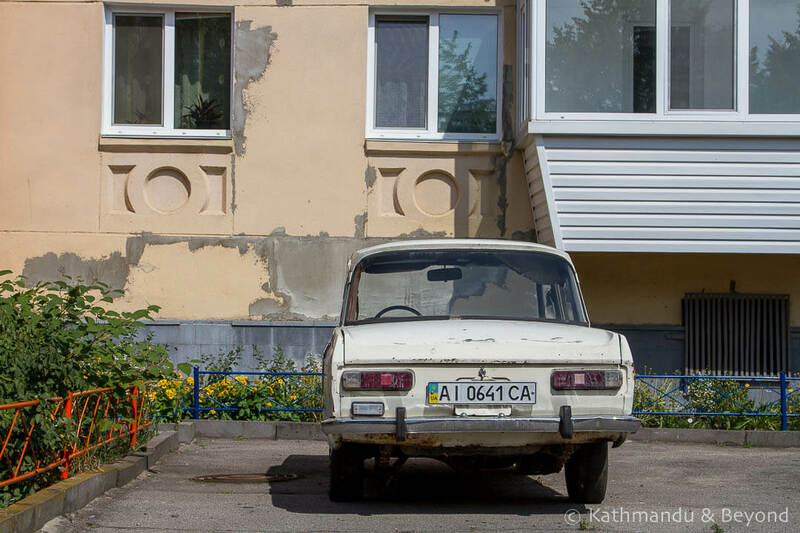 We spotted numerous classic cars during our time in Slavutych. I believe the one in the middle is a British-built Ford Cortina Estate, of which you don’t see many anymore. The Church of God’s Prophet Elijah. 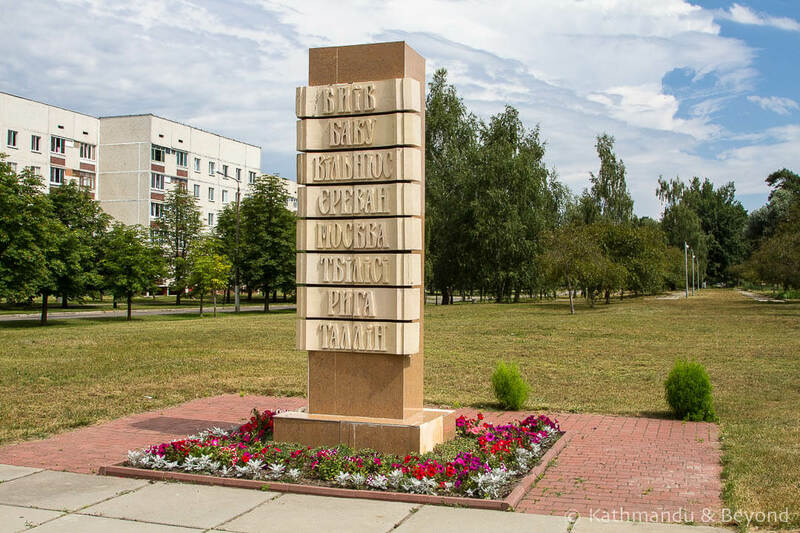 This monument is dedicated to the eight countries involved in the creation of Slavutych. This is the city’s town hall/municipal building and its design is typical of those found in other Ukrainian cities. Many of the neighbourhoods have their own meeting area/sports hall like this one and appeared to be communities in their own right. Firstly, it would take 2½ to 3 hours to reach Slavutych from Kiev and that’s not including the time it takes to cross Kiev in order to catch the transport in the first place. That’s too much driving for a day trip in my opinion. Secondly, there is more frequent public transport from Chernihiv than there is from Kiev. But the main reason we used Chernihiv as a base is the fact that the city itself is one of the most attractive places we have been to in Ukraine. We intend to write more about the city soon but, in short, it is a lovely place with plenty of architecturally-interesting churches, an engaging riverfront, and an impressive main square. In fact, it is a worthy side trip out of Kiev in its own right and combining it with a visit to Slavutych is even better. In order to visit Slavutych from Chernihiv, you have to first make your way to the train station as this is where the marshrutkas depart from. Bus numbers 11,12 and 43 will get you there from the city centre (4UAH). When you arrive at the train station, head to the left of it, ask around and someone will point you to the right spot for the marshrutkas to Slavutych. It’s a good idea to have Slavutych written in Ukrainian (Славутич) because, if you’re anything like us, you won’t be able to pronounce it properly and marshrutka drivers will just look at you blankly. In July 2017 the one-way fare was 35UAH (£1, US$1.30, €1.10). As mentioned earlier, we came back to Chernihiv on a bus that was continuing to Kiev. It also dropped us off at the railway station and the fare was 25 UAH. 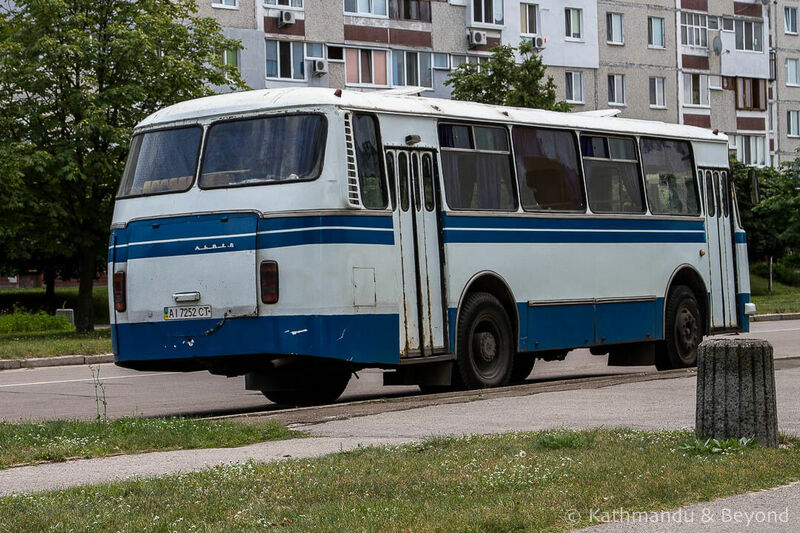 You will be dropped at the small bus station in Slavutych, which is right next door to the train station. We didn’t see a lot of transport in the centre of Slavutych. In fact, apart from in the city centre, we didn’t see many people either. 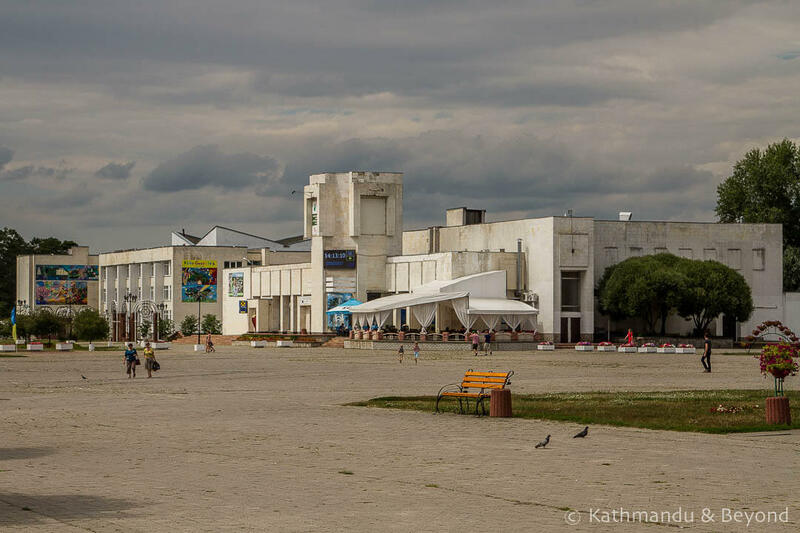 Is it OK to visit Slavutych and take photographs? Yes. We were a little concerned about the sensitivity of visiting the city and taking photos but nobody gave us a secondary glance during the time we were there. We travel with a DSLR camera and lenses. Normally we keep our camera out in full view when walking around a place but in this instance, we decided to keep it inside a bag and only take it out when we wanted to take photos. Were we being overcautious? It’s difficult to tell but I always think it is better to be safe than sorry plus showing some respect for the situation around you never does any harm either. As in most cities and towns in Ukraine, there are reminders of the ongoing war in the east of the country in Slavutych also. Is there somewhere to stay in Slavutych? There are a couple of sleeping options in Slavutych but we only discovered this during our visit and not before so we didn’t entertain the idea of spending the night there. I’m sure overnighting would not be a problem. After all, many foreign advisors and workers previously used Slavutych as a base for Chernobyl (those days are gone now), but it is so easy to visit as a day trip from Chernihiv and you can see everything of interest in a relatively short space of time that I see little point in doing so. If you do want to overnight, the originally named Hotel Slavutych is located in the centre of town and is probably the best bet. Are there places to eat in Slavutych? Slavutych is like any other Ukrainian town in that respect. There are fast food joints near the market, which in turn is close to the railway station. There is a large supermarket in the main square and we saw at least two restaurants, both of which were also in the centre. The one to head for is the Old Tallinn restaurant. Not only was the food tasty and ambience good, but they also had an English menu (oh, joy of joys!) and a couple of the waitresses (kitted out in traditional Estonian dress no less) spoke some English. Look no further than the Old Tallinn restaurant for all your culinary needs, would be my recommendation! 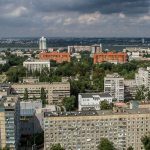 Is it worth visiting Slavutych? Slavutych is worth visiting for a number of reasons. 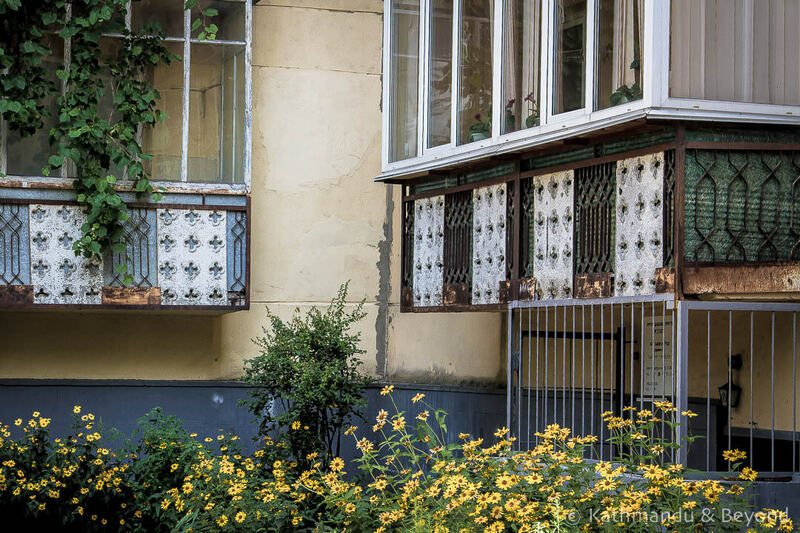 For people with an eye for Soviet architecture, visiting Slavutych offers an unparalleled opportunity to see many different styles in one place. It also provides an easy opportunity to really get off the beaten track in Ukraine. 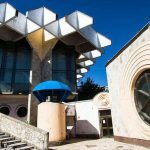 Some would argue that simply visiting Ukraine is off the grid but if you like the country and want to see something completely different, Slavutych fits the bill perfectly. 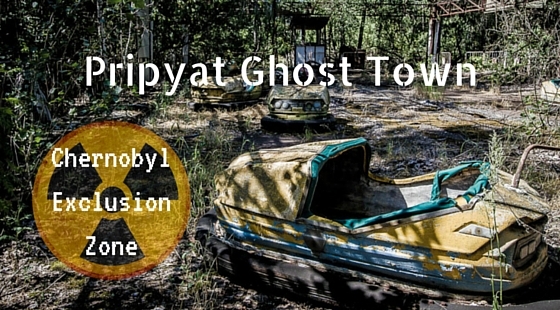 Finally, for those interested in the history surrounding the Chernobyl disaster, assuming you’ve visited the actual plant and the very informative Chernobyl Museum in Kiev, making the trip to Slavutych is like adding the final piece to the jigsaw. Megan Starr: the reason we visited Slavutych in the first place. 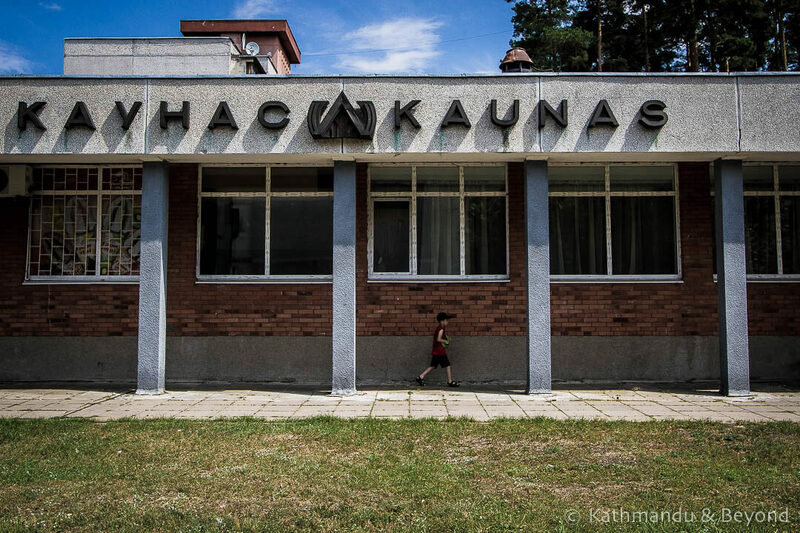 Radioactive Railroad: Reborn in Slavutych. I’ve given a link to the piece on Slavutych but all of the articles on this website are worth browsing. DID YOU FIND THIS POST INTERESTING? WHY NOT PIN IT? 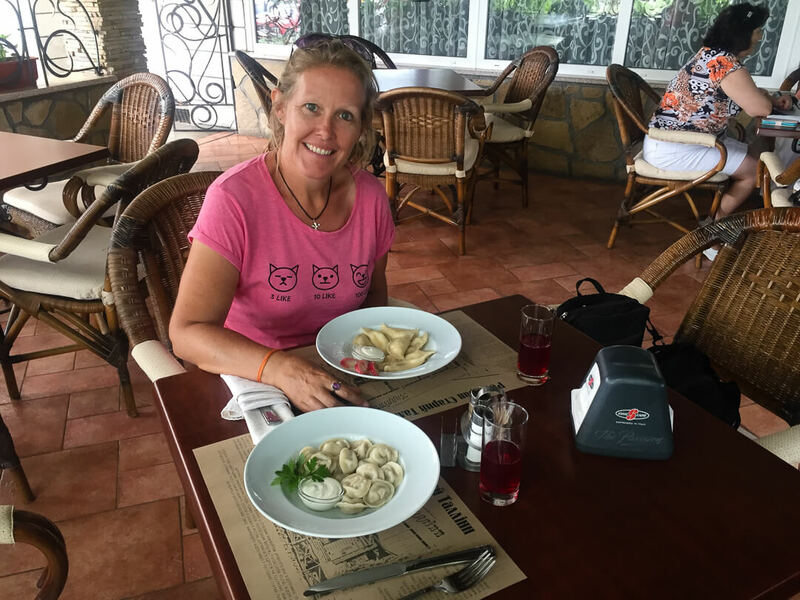 Yep, the pelmeni were pretty tasty! We thought twice about heading into the woods as one article we read said the area was home to drunks and addicts but we saw no evidence of this. The photo was taken just by the medical centre. I’m glad you enjoyed seeing photos of the city once more, it’s down to you that we visited in the first place so thanks for that! This is really interesting. I was wondering where all the people they evaculated after Chernobyl went. I’m now off to check out your other Ukraine posts! Thank you! 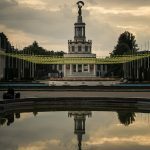 I believe you live and work in Kiev – getting up there via Chernihiv for a weekend is nice and easy and Chernihiv itself is a lovely city and well worth visiting. We haven’t written about everywhere we’ve visited in Ukraine yet but if you are thinking of heading somewhere and it’s not on our blog, give us a shout as we have covered a lot of ground in the country now and may be able to help with tips etc.